recently also started to use desalination as a way to supplement and diversify their water supply options. Until a few years ago, desalination plants were limited to the water-scarce but oil-rich countries of the Middle East and North Africa, and to some tropical and subtropical islands. Today, desalinated water has become a commodity for many countries in order to satisfy their growing demand for water. For the "pioneering" countries, the driving factors were often a lack of surface and groundwater resources, coupled with sufficient natural or financial resources to engage in energy-intensive and costly desalination projects. For the newly emerging desalination markets, driving factors are more diverse, including economic and demographic growth, prolonged droughts, climate change, or declining conventional water resources in terms of quality and quantity due to overuse, pollution, or salinization. 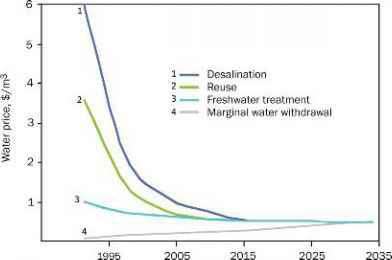 Moreover, as conventional water production costs have been rising in many parts of the world and the costs of desalination - particularly seawater desalination - have been declining over the years, desalination also becomes economically more attractive and competitive (Fig. 1). This chapter gives a short account of the historical development of desalination technologies, an overview on the presently installed worldwide desalination capacity, distinguishing between different raw water sources, processes and use types. 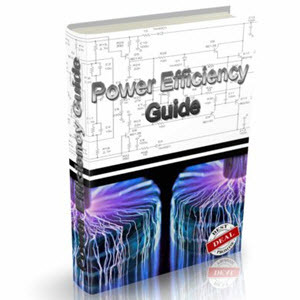 It furthermore discusses regional and future trends, driving factors such as cost and energy demand, as well as concerns, such as the environmental impacts of the discharges into the sea. The extraction of salt from salty water by means of natural evaporation has been practiced for a long time, dating from the time when salt, not water, was the precious commodity . Advanced technologies that mimic natural processes such as evaporation or osmosis in order to extract the water have only been developed in modern times. Basic desalting processes were first used on naval ships in the 17th to 19th centuries. The island of Curacao in the Netherlands Antilles was the first location to make a major commitment to desalination in 1928, followed by a major seawater desalination plant built in what is now Saudi Arabia in 1938 [1,2]. 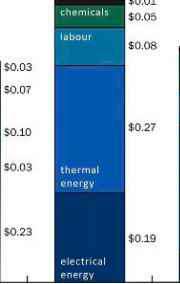 Figure 1 Water resource cost trends in the desalination market in US$ per cubic meter. Top: Total installed capacity and water price development. Bottom: Differentiated between water source type. Adapted from Ref. .
(OSW) in the early 1950s and its successor organization, the Office of Water Research and Technology (OWRT) in 1974, helped to provide much of the basic research and development of the different desalting technologies [2,3]. Many of the early projects focused on thermal processes. Significant work was completed on construction materials, heat transfer surfaces, and corrosion, which was instrumental in assisting the design and construction of the first large distillation systems in the Middle East . The multieffect distillation (MED) process has been used in industry for a long time, traditionally for the production of sugar and salt. Some of the early distillation plants also used the MED process; however, the multistage flash (MSF) process that was developed in the 1950s continually displaced the MED process due to a higher resistance against scaling. A revived interest in MED can be observed since the 1980s due to a lower operating temperature and energy demand of the process . During the late 1950s, the first asymmetric membrane for desalination was developed by Loeb and Sourirajan, which consisted of cellulose acetate polymer . The electrodialysis (ED) process, which was commercially introduced in the early 1960s, moves salts selectively through a membrane driven by an electrical potential. It was the first cost-effective way to desalt brackish water and spurred a considerable interest in using desalting technologies for municipal water supply, especially in the United States. ED is exclusively applied to low brackish and fresh water desalination, since the energy consumption for seawater treatment would be far too high. Other milestones included the commercialization of reverse osmosis (RO), a pressure-driven membrane process, in the early 1970s , followed by the development of a more robust composite aromatic polyamide spiral wound membrane in the 1980s . Although a wide variety of membrane materials and module configurations have been developed over the years, including hollow fine fibers from cellulosic or noncellulosic materials, composite aromatic polyamide membranes in spiral wound configuration are almost exclusively used in modern RO plants today. While cellulose acetate seawater membranes had a specific permeate flux of 0.5L/(m2hbar) and a salt rejection of 98.8% in the 1970s, the latest polyamide seawater membranes have a specific flux of more than 1.2L/(m2hbar) and a salt rejection of 99.8%. The improvement in specific flux translates into a significant reduction of the specific energy demand of the RO process . Another significant power and cost reduction stems from the development of energy recovery devices, which result in a total energy demand of 3—4kWh/m3 of permeate water using state-of-the-art technology. To conclude, it took about 50 years to evolve from the first land-based distillations plants into a fully developed industry in the 1980s. By the 1990s, the use of desalting technologies for municipal water supplies had become commonplace . Today, municipalities are the main end users of desalinated water and the market continues to grow exponentially, with a doubling of the installed capacity expected from 2006 to 2015. RO has emerged as the most important desalination process today (Section 3, [5,6]). In 1969, the world's largest RO system in operation was a 380 m /day brackish water plant in Dallas, Texas . Today, the largest seawater RO plant produces 330,000 m3 of water per day, the equivalent of 132 Olympic-size swimming pools, using 27,000 membrane elements with an active surface area of about 99 ha (or 200 football fields), which need to be replaced every 3-7 years. Currently, the membrane market is estimated to have current sales in excess of US$ 500 million per year, and an annual market growth at about 16% annually . The worldwide installed desalination capacity is increasing at a rapid pace. The latest figures from the 20th International Desalination Association (IDA) Worldwide Desalting Plant Inventory  indicate that the production capacity of all desalination plants worldwide was around 44.1 million cubic meters per day (Mm3/day) by the end of 2006. This figure includes all facilities listed in the inventory that treat seawater, brackish water, river water, wastewater, brine, and pure water, which are either in construction, online, or presumed online. The worldwide installed capacity grew at a compound average rate of 12% a year over the past 5 years, and the rate of capacity growth is expected to increase even further. Based upon country-by-country analysis involving desalination projects and official data on water supply and demand from agencies around the world, it is projected that the installed capacity will presumably reach 64Mm3/day by 2010 and98Mm3/dayby2015 (Fig. 2) . Much of the expected growth of the desalination market will take place in the seawater sector, although brackish water and wastewater desalination processes will presumably become more important in the future. Only 5% of the total volume of 44.1 Mm3/day presently comes from wastewater sources, 19% is produced from brackish water sources, and 63% from seawater sources (primary data from Ref ). Desalination of seawater is hence the dominant desalination process and accounts for a worldwide water production of 27.9 Mm3/day (Fig. 3, top). For illustration, this is a volume comparable to the average discharge of the Seine River at Paris (average flow of 28.3 Mm3/day). Figure 2 Projected growth of the desalination market (including seawater, brackish water, river water, wastewater, brine, and pure water desalination processes). The installed capacity was 44.1 Mm3/day in 2007  and is expected to more than double by 2015. At that time, 38Mm3/day will presumably be installed in the Gulf region and 59Mm3/day in the rest of the world . production of desalinated water comes from distillation plants, either using the MSF or the MED process, with relative market shares of 32% (14Mm3/day) and 8% (3.7Mm3/day), respectively. Other minor desalination processes include the membrane-based nanofiltration (NF) and ED process with about 4% market share each (2 and 1.6 Mm /day, respectively). The picture changes if one distinguishes between the different source water types. Thermal desalination processes account for 61% (17.2Mm3/day) of the production in all desalination plants that use seawater as raw water source, of which 50% is produced in MSF plants. Only 35% of the water comes from RO seawater desalination plants. On the contrary, RO accounts for 84% (6.9 Mm3/day) and 79% (1.7Mm3/day) of the production in brackish water and in wastewater applications, respectively, whereas distillation processes play a negligible role in brackish water (<2%, 0.1Mm3/day) and a minor role (13%, 0.3Mm3/day) in wastewater desalination (primary data from Ref. ). All source water types included, desalinated water is mainly used for municipal and industrial purposes: 70% (31 Mm3/day) of the globally desalinated water is used by municipalities and 21% (9 Mm3/day) by industries (Fig. 3, third row). Other end users include the power generation industry (4%), irrigation (2%), military (1%), and tourism (1%). Figure 3 Global desalination capacities (in Mm3/day and %) by source water type (top row), by process and source water type (second row), by use type and source water type (third row). Data analysis based on primary data from Ref. . Abbreviations: RO, reverse osmosis;MSF, multistage flash distillation;MED, multieffect distillation;NF, nanofiltration;ED, electrodialysis;XL> 50,000 m3/day>L> 10,000 m3/ day>M> 1,000 m3/day>S (see plate 1 in color plate section at the end of this book). sea and brackish water and account for 83% (23.2Mm3/day) and 61% (5 Mm3/day) of the production, respectively, and 20% of the production of repurified wastewater. As one moves from seawater to brackish water and wastewater, the share of municipal use decreases, while the share of industrial use increases. The latter accounts for 12% of the production from seawater, 23% of the production from brackish water sources, and is the primary user of repurified wastewater: 39% (0.8Mm3/day) is used for industrial purposes plus an additional 12% is used by the power industry. Irrigation is only the second most important use of repurified waste water with a share of 27% (0.6Mm3/day) after industrial use (39% of the wastewater) (primary data from Ref.). Forty-nine percent of the desalinated water is produced by very large facilities with production capacities of 50,000 m /day or more ("XL-sized" plants, Fig. 3, last row). The share of production in very large facilities is even higher in the seawater sector, where 66% (18.2 Mm3/day) of the water is produced in only 122 industrial-sized plants. On the other end of the scale, about 1660 small seawater desalination facilities with production capacities of less than 1000 m /day account for only 2% (0.6 Mm /day) of the production. 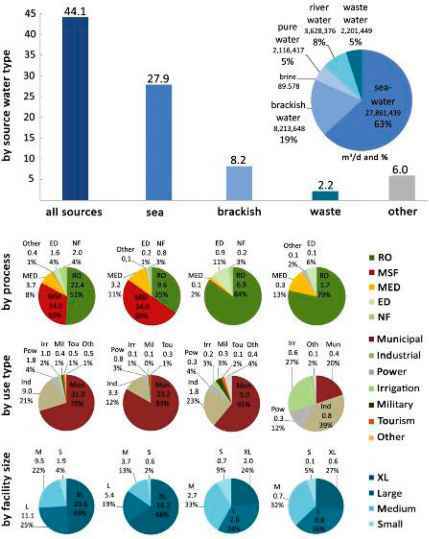 The plant size distribution is a bit more homogeneous in the brackish (BW) and wastewater (WW) sectors, where 24% (BW) and 27% (WW) of the water is produced in XL-sized plants, where large plants account for 34% (BW) and 36% (WW) of the production, medium plants for 33% (BW) and 32% (WW) of the production, and small plants for 9% (BW) and 5% (WW) of the production, respectively (primary data from Ref ). To conclude, most of the desalinated water today is produced in industrial-sized facilities. These include the large thermal distillation plants in the Middle East with production capacities up to 1.6Mm3/day. Outside the Middle East region, seawater reverse osmosis (SWRO) is the dominant process that finds application. Majority of the SWRO plants (59%) are small (< 1000m3/day) and account for only 5% of the worldwide production of 9.4Mm3/day, while 2% or 42 large facilities (> 50,000 m3/day) account for almost (45%) half the worldwide production. The largest RO plant currently produces 330,000 m3/day and a few RO projects up to 500,000 m3/day are being planned. 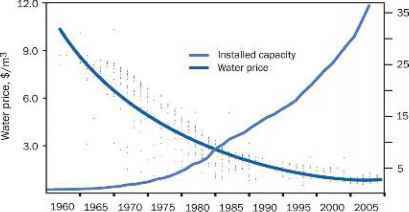 The rising costs of conventional water production (Fig. 1) that are observed in some parts of the world are caused by increasing technical expenditure and costs for treating water from conventional sources and for transporting water over long distances. The water production costs have risen -depending on the country, supply, demand, and technology - to US$ 1-1.5 m-3. At the same time, the cost of drinking water from desalination has been decreasing, in some places even below the cost of conventional water production. The causes included improved design and technology, especially of RO processes, the adaptation of facilities to local demand, or the use of cheapest energy sources . Figure 4 Relative operation costs in US$ of the main desalination processes. Adapted from Ref. .
current energy prices on the increase, desalination may again become a more costly water supply option in the future. energy demand for SWRO plants usually increases with recovery, but the total energy demand decreases with the recovery rate as less feedwater must be pumped and treated to obtain the same volume of permeate at a higher recovery. Therefore, it is important to analyze the desalination process as a whole, and not just the SWRO-specific energy demand. At the most affordable point for a 190,000 m3/day plant, total treatment energy in the range of 2.75-2.98 kWh/m3 was demonstrated . Forty-eight percent (21.0 Mm3/day) of the global desalination production takes place in the Middle East, mainly in the Gulf country states (19.3 Mm3/day). Nineteen percent of the desalinated water is produced in the Americas (8.2Mm3/day), 14% in the Asia-Pacific region (6.2Mm3/ day), 14% (6.0Mm3/day) in Europe, and 6% in Africa (2.8Mm3/day, Fig. 5, primary data from Ref. ). Except for one region, seawater desalination is the prevalent process. Sixty-one percent (17.1 Mm3/day) of the global seawater desalination capacity is located in only six GCC countries, including Saudi Arabia, the United Arab Emirates, Kuwait, Bahrain, Qatar, and Oman. Another 11% (2.9 Mm3/day) of the global seawater desalination capacity is located in Southern Europe and 7% (2.0 Mm /day) in North Africa. Three enclosed sea areas therefore account for the lion's share of the global seawater desalination capacity - the Gulf, the Red Sea, and the Mediterranean Sea. North America is the only region where brackish water desalination is the dominating process. The production capacity is 3.0Mm3/day, which represents more than one-third (36%) of the global brackish water desalination capacity. Twenty-one percent of the production from brackish water sources takes place in the GCC states (1.7Mm3/day) and 13% (1.1 Mm3/day) in Southern Europe. 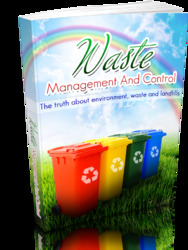 Wastewater purification is also primarily practiced in North America (22% or 0.49 Mm3/day), closely followed by East Asia (21% or 0.46Mm3/day) and the GCC country states (19% or 0.42Mm3/day). Each of these three regions accounts for roughly one-fifth of the global wastewater treatment capacity, followed by Japan, Korea, and Taiwan (12%) and Southern Europe (10%). In the following, emphasis will be given to the Gulf, the Red Sea, and the Mediterranean Sea and the installed seawater desalination capacity in these sea regions.